Corporate Realty is proud to publish this 2nd Quarter 2015 Office Leasing Report prepared by Bruce Sossaman, Leasing Director of the Lakeway Center and Broker Associate, in cooperation with building owner representatives. Bruce reports that the class A CBD and Elmwood office markets both showed strong absorption in the second quarter. The CBD class A market absorbed over 28,000 square feet and the Elmwood market absorbed over 27,000 square feet due to the pending sale of the 990 N. Corporate Building sale to an owner/user. 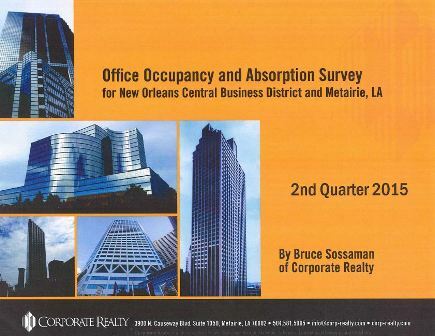 To learn more about the New Orleans CBD and Metairie office markets, download this report, as well as our historical market reports, on our reports page.